Though the lion’s mane has long been believed to provide a shield around the male’s neck, lions do not target the necks of their opponents. Instead, the mane serves as a reliable indicator of the male’s quality: males with darker manes live longer and their offspring have higher survival. Females prefer to mate with dark-maned males while rival males are inhibited by them. Lions form like-sexed gangs that fight each other vigorously. Male coalitions compete for access to females, and female prides compete intensively for access to prime real estate. Larger coalitions gain more females over their lifetimes while larger prides gain higher quality territories. Females rear their cubs together in a “creche” so as to be able to defend their cubs collectively against incursions by potentially infanticidal males. 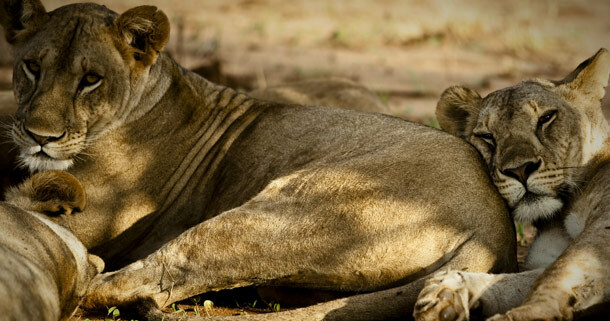 Female lions sleep most of the day, and cubs sneak milk from females other their own mother when they can. Additionally, females produce the same amount of milk whether they have a litter of one or four cubs. Thus mothers of singleton cubs can afford to be less watchful of parasitic non-offspring. Lions mostly hunt cooperatively when they need to. For example, everyone lends a hand when the pride is hunting large dangerous prey such as Cape buffalo. But when a single hunter is likely to succeed by herself, the rest of the pride is content to let her do all the work. Lion populations are essentially limited by space: being territorial, prides of lions defend as large of an area as they can. When the habitat is filled with established prides, new prides cannot establish themselves. The size of a territory is ultimately set by prey density. Lion territories are smaller in parks and reserves with higher prey densities. Information provided by Dr. Craig Packer, Director of the Lion Research Center. More information can be found on their website.